Camping always gives thrilling experience no matter what time of the year you plan for it. However, if it’s winter and you are extremely enthusiastic to go for winter camping, then you’ve gotta be very careful. Why? Because to enjoy your camp time to the fullest, you need the best extreme cold weather tents. So, are you searching for the best cold weather tents? If yes, then you need to know which are the best extreme cold weather tents before you actually purchase one. To tell you the truth, it’s not really easy to identify randomly one best tent. One must have to spend quality time on research, study and explore the market before making the decision. Well, we know it’s a lot of hard work and requires a lot of time. Therefore, we have taken the hassle on behalf of you. Spending a total of 72 hours studying and understanding about factors related to tents, features, and qualities, we have come up with 10 best cold weather tents for you. Here, we are going to evaluate these 10 products for you so that you can easily understand their quality and choose which one you are going to purchase. Here, all these products are not only popular in the market but also highly recommended by the users and professional travelers. In our review, we are going to explain the positive and negative aspects of each tent which will help you to decide the right tent for you easily. Moreover, for your profound understanding regarding the best cold weather tents, we are also sharing some additional information such as the importance of tent, types of cold weather tents, tips of winter camping, must-have features to look for and risk factors, etc. following the products reviews. Now, let’s get started with the reviews first! Why do you need the best cold weather tents? When you are planning for camping with your family or friends, I’m sure you don’t have any plan to sleep outside the tent. Unless you want to test your limit of tolerance. But, compared to any other season, winter is one of the unpredictable seasons when any winter activities might face a challenge due to the sudden temperature drop. You might find it an unnecessary expense when you already have a tent. Moreover, winter tents are a bit weighty compared to the summer ones. Therefore, instead of carrying a heavy tent, they think of using your regular tent and carry warm clothes to survive in cold weather. It may help you stay warm in moderately cold weather. But, it’s always uncertain when the temperature drops, or snowfall increases. Then, you will have to shiver in the cold even inside your tent. You may also need to carry extra items like fire, stove, wood, etc. When a cold weather tent comes with the right warmth you need to give you the comfort and heat, isn’t it wise to get a good quality tent despite carrying a lot of additional items. Even, some tents come with advanced features that give you shelter and helps you sleep in a cozy atmosphere. Whether you want to fit in a tent with your friends or family, the tents come in various sizes to comfortably share with 4 to 6 people. That is why, to stay away from all the struggle and focus on enjoying the camp experience, having a cold weather tent is the right idea. They are also available in different types and sizes for you to choose the ideal one you need. 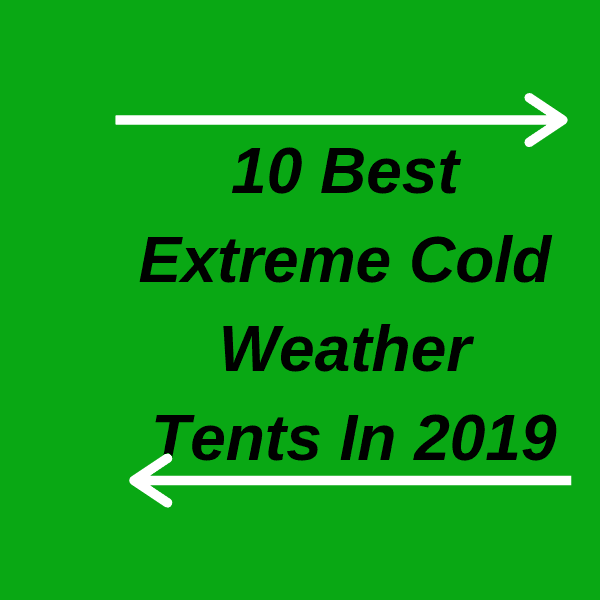 Here, from a neutral perspective, we are going to review 10 top rated cold weather tents that work wonderfully during extreme winter. Each of the items is found to perform effectively that the users recommend others to purchase as well. These are not only good quality but also from renowned brands. From our review, we will discuss the significant features including the aspects we liked and did not like. Surely, the review will help you find the right tent for you. Are you looking for a big size tent? Here it is. The renowned brand Coleman has launched this Weathermaster tent that can accommodate up to 6 people easily. Moreover, the Weathermaster technology ensures your tent is warm and dry even during extremely cold weather. That’s not all. There are some other advanced features that make this tent an extraordinary one and also forced us to list as the best extreme cold weather tents. Let me tell you the most unique feature first. You will rarely find it in another tent. That is the screen room. Yes, the screen room helps you safe from bug and ensure ventilation. The tent also comes with a tub floor and welded corners so that it can be protected against water. Also, for easy entry and exit, the tent comes with the hinged door. Are you worried about the stability of such a huge tent? Don’t be! Because the tent comes with an Insta-clip suspension to stand steady and secured. Overall, it’s a portable room which comes with everything you need. There is also an E-port where you can easily plug in your electrical devices. Also, to store your notebook or magazine, you can use the storage pockets. So, now we understand why the Coleman WeatherMaster tent is highly demanded. It comes with high quality and comfort that you seek for winter camp. You can definitely purchase this amazing tent for a group camping. Do you like Coleman’s tents? Great! Here is another option for you. 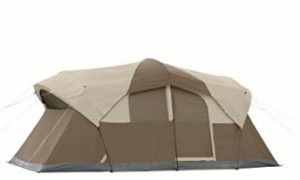 As our second best extreme cold weather tent, we recommend you even a bigger tent from this brand that can accommodate 10 people at a time. It also comes with Coleman’s signature Weathertech feature that will keep you safe from rain and snow. Let’s find out the other features. If you are planning for family camping, you can definitely choose this tent. You can easily fit in three queen size bed and other accessories. This tent is not only spacious but also tall enough to stand comfortably. It’s like a portable house that comes with the hinged door. One of the remarkable features that make this tent stand out is the adjustable ventilation system. You can customize the inside temperature according to your comfort level. Nevertheless, the tent also has reverse-angled windows that will help you get light and air. Overall, it’s weather resistant and waterproof tent that you can use from moderate cold to extreme cold weather. So, if you are on a family trip and don’t want to purchase a single sleeping bag for each person, you can save your money purchasing this one family size tent. Do you find the first two tents are too big for you? Looking for a small tent from a renowned brand? Don’t worry. We know what you are looking for. Thus, for our third best winter tent, we have picked another popular tent from Coleman. Hope it will be your best cold weather tents. Since it’s from Coleman, there is no doubt about quality. 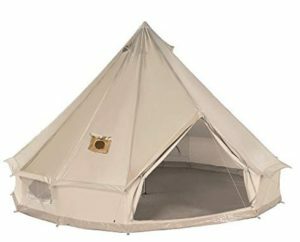 Similar to the other two tents, this tent also comes with weather tech system, welded floor, and inverted seams. So, you do not need to worry about getting cold or wet. The tent fabric and build quality will keep you warm and dry. Since it comes with a small interior space, it will be easy to carry and take anywhere. Moreover, you won’t have any trouble setting up the camp. Besides, it comes with vestibules, so you can keep the shed open and enjoy nature. Overall, it’s a handy backpacking tent from Coleman that you can definitely have for a couple winter camp. It also comes at a very affordable price. Do you need an all season tent? If yes, then you can consider this canvas tent from Kodiak. 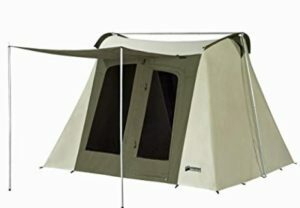 This tent is suitable for 6 people that comes with two doors and four windows. It’s a simple tent that comes with the necessary features that you need for camping. Let’s find out what are they. As from the name you can guess the tent is made of canvas. It’s one of the most appropriate breathable material that ensures more insulation. Even though the material ensures the interior atmosphere remains cool, it’s a waterproof tent. So, you don’t have to worry about getting wet. Nevertheless, even though it’s not a free-standing tent, it’s easy to set up by one person. In the first try, it might seem troublesome, but you will get used to it. It’s a strong and durable tent for all time use. However, it’s not recommended for extreme cold weather. 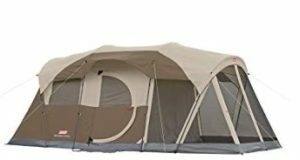 So, if you are an occasional camping person and need a regular use tent, you can consider purchasing this Kodiak canvas tent. Are you searching for a stylish yet comfortable backpack tent? There you go. We present to you one of the best-selling lightweight tent MSR Hubba Hubba. It’s an ideal tent for two people. If you are planning for a couple picnic, hunting or camping, you can definitely get this tent without any doubt. This is one of the best extreme cold weather tents. One of the significant features of this tent is, it’s made for three seasons. 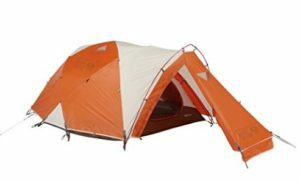 That means you can plan for hiking, hunting or any outdoor activities with this tent. It’s not only lightweight and portable but also easy to set up. The freestanding tent will surely save your time, energy and definite generate more fun. Additionally, there are also two vestibules available. You know what you can do when you have vestibules. Simply leave them open whenever you want and enjoy the time inside the tent. Besides, there are two doors, mesh panel for a proper ventilation system. What else do you need? It’s one of the most demanding tents for two people you want to try. Hurry up before the item is stock out! Here is another budget-friendly yet high-quality tent suitable for two people. The tent is from Geertop. It’s another tent that you can use for several seasons. Let’s find out its other details of the best camping tent. The tent is made of anti-tear checkered polyester. No matter how roughly you use the tent, there is no risk of tearing. Also, the fabric is coated with a water-resistant finish. Along with this technology and the dome shape will not only keep your tent protected from rain and snow but also harmful UV rays. Since the size is very convenient, you can easily set up with the flysheet and fold off. Regarding the building quality, the tent is designed with two layers. This construction helps to have proper ventilation and stay steady in the heavy wind. 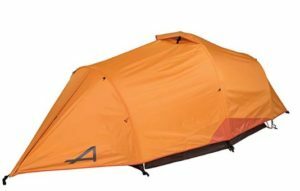 So, if you are looking for a budget-friendly tent to use in spring, summer, autumn, and winter, you can surely choose this Geertop backpacking tent. It would be an ideal choice for the money. If you still haven’t got your desired free-standing tent. 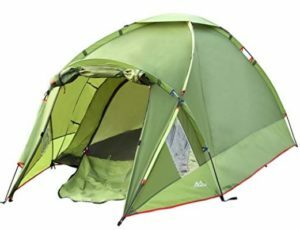 You can consider this Alps mountaineering tent. It’s one of the great tents of winter camping at an affordable price. The Alps is a renowned leading brand that has been manufacturing a variety of tents for years. 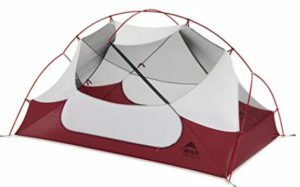 Being consistent with their quality products, this brand has launched this amazing tent for two people. Why people like this tent so much? Because of its durability. The material used in the tent wall is thick polyester taffeta. Moreover, it is coated with PU to save the tent from rain, snow, and heavy wind. If you use the tent in winter, it will be able to keep you dry and warm just as you want. Another great feature of the tent is the free-standing pole system. Even though its a bit difficult to carry compared to its size, you can still set up the tent easily due to the free-standing system. The pole is also constructed with durable and weather resistant aluminum material. Overall, it’s a strong tent you can purchase at a reasonable price. It would be a long-term investment for you as you will be able to use the tent for years. Here is our 8th best extreme cold weather tent for two people. The tent is from Mountain Hardwear. If you are looking for an outstanding quality tent in a limited budget, you can check out this tent. This tent comes with all the essential and advanced features that you need for winter camping, hunting, hiking, etc. Even though it’s considered a very useful tent for winter, you can still use it for other seasons. 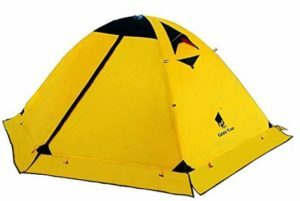 Actually, it’s categorized as four season mountaineering tent that has been preferred by the hunters, hikers, and campers. Since its a popular tent, the build quality must be strong. Therefore, this tent is constructed with thick fabric and coated with nylon ripstop DWR. additionally, to keep the floor warm and water resistant, these sections are coated with Nylon Taffeta. It will ensure warmth and zero existence of water inside your tent anytime you go camping. Similar to any other great quality tents, this tent also has a strong pole, vestibule, storage, doors, and a good ventilation system. 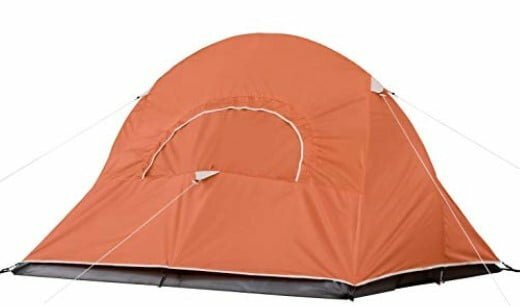 You should check this tent before you purchase. Are you looking for an all-season tent? Can’t find a reliable one? Here we present to you a durable and waterproof tent for camping with your family. It’s the ideal tent that you are looking for which will save you from rain, snow, and heavy wind. Even though the size is big, still you can easily set up the camp and fold off. For your convenience, the tent comes with a carrying back. You just need to fold the tent in the bag, and you are ready to go. Nevertheless, the overall construction of the tent makes it a strong and long-lasting one. Similar to other great tents, it also comes with vestibules where you can keep your bag, shoes and other accessories. Another remarkable feature of this tent is, it’s not only resistant to water and snow but also fire. So you are completely safe with the tent no matter you use it for hiking, hunting, picnic or camping. Certainly, it also has a strong ventilation system, doors, and windows. You can keep this family tent in your top list before purchase. As per the appearance, the Danchel cotton bell tent looks like a traditional tent. Even though such kinds are rare to find these days, I think they are unique and serve the purpose rightfully. Now let’s talk about its internal features of the best cold weather tents. Due to the shape, a tall person can easily fit in the tent. Also, the canvas fabric used in the tent ensures breathability which is necessary for all season winter activities. On the other hand, this tent comes with stove jackets. It’s also not available in most tents. So, you can easily use a wood stove inside the tent. If you are planning to use the tent for many people, then it’s recommended not to use the stove jackets. Otherwise, you can easily use the stove for cooking. Overall, its a tent for all season that is strong enough to support you during heavy wind and destructive calamities. It’s also easy to set up by one person. Even though its the 10th best cold weather tents, it comes with extraordinary features and quality that make this tent a unique one. If you search on the internet, you will find a wide diversity of tents even for winter camping. Usually, there are some common features that you will find in all winter tents such as warmth, protection from external elements, waterproof, etc. But, depending on the activities you are going to explore in your camp time, you should choose the right type of tent. Since it’s not possible to explain the details elaborately in a few sentences, we would like to provide you with an overall understanding so that you may know how to choose a tent. Below are some of the popular and useful tents that are commonly used for winter camping. The winter tents are built to keep you warm and stand strong. The regular winter tents are usable in normal to medium cold weather as it can easily give you the warmth during snow. There is also a variety of category and features in winter tents. From there, you can choose whether you need an extreme cold weather tent or 3 or 4 seasons tent. The cool weather tents are very effective for the moderate winter season. Also, you can use them in other seasons when you want a bit of warmth and comfort. However, they do not have much strength to support during heavy wind or snow-fall. The extreme cold weather tents are highly effective for heavy wind, snow, and similar natural calamities. They are designed and built with durable quality. The most remarkable feature of such a tent is you can use a wood stove inside. The insulated tents are suitable to use in any season. If you are looking for a tent for regular use and do not want a special tent for a certain season, then this type of insulated tent would serve the purpose you need. Whether you are going for a family camping or picnic, you can surely pack this tent to enjoy your camp time. Cool weather tents are also suitable for hunting. They are available in different sizes. You can easily get specious tents for hunting which are also reusable in three to four seasons. Perhaps you already have a well understanding regarding the do’s and don’ts for camping in cold weather. Yet, human beings are forgetful. Anyone may miss a thing or two before going to the camp. That is why we have enlisted some of the important tips for you that will help you stay warm and healthy. Go through them; also, you can add them to your checklist to remember during packing. No matter when you go for it, camping is always exciting. And, when we are overly excited, we often overlook what we must take. Therefore, below are a few things that you should be prepared with before going camping, especially in winter. You can mark the date on your calendar when you will be leaving for camp. Keep a regular update of the camp location and make of list of things that might be needed. Make a list of things that would keep you warm such as hand gloves, socks, fur coat, woolen cap, boots, etc. Don’t forget to take a backpack, winter tent, sleeping bag, sleeping pad, flask, stove, torchlight, shovel, lighter, etc. First, I will recommend you to read How to stay warm in a cold weather tent this article. As you reach the camp location, you are about to set your tent. Where do you do it? Well, you’ve gotta be a little careful regarding where to set up your camp and ideas to keep you warm. You will get some of the points below that might help you at the camp to stay comfortable. During choosing the place setting up the tent, choose a place where you will be safe from heavy wind and danger. It would be better if you can choose a place you will get sunlight. Also, avoid the slippery area to set up your camp. Before setting up the tent, walk around the snow with snow boots. Otherwise, if the snow melts with your body warm, it will make you feel uncomfortable. Set up the base of your tent with waterproof pads and insulation. As you set your camp, there comes the need to prepare your food. Where do you do? Make your own kitchen near your camp. How do you do it? Shovel the snow to make your cabinet, cooking place, seats, table, etc. you can also cover your DIY kitchen with a tarp or fabric. Prepare simple meals and stay hydrated. Use a spacious and lightweight backpack to carry all the items. Bring liquid fuel stove and extra fuel. For the utmost camping fun, don’t forget to bring your snowboard, skis, and snowshoes. Keep your electronic items charged. What is the most important thing you must not miss? Surely a tent. If this tent isn’t chosen carefully and wisely, then the camp experience may turn from thrilling to nightmare. But, amidst thousands of tents and renowned brands, finding the right tent, especially for winter is not an easy job. Thus, here we’re going to share some of the features that must be present in your targeted extreme cold weather tent. Weather resistance is a must. Whether you are going for a camp in summer or winter, if the tent is not resistant to water or wind, then you are going to struggle with a wet and dirty tent. Therefore, choose a tent which is made of waterproof material and coated with polyurethane. Also, to keep you dry and let you sleep comfortably, make sure the tent has a waterproof floor tarp. So, keep these factors in mind before the final purchase and don’t forget to buy the best cold weather tents for you. How warm your winter tent will depend a lot on its build quality. Therefore, to ensure your tent is going to be warm enough, choose a tent that comes with double wall construction. This is because the interior of the tent will be insulated to keep it warm. On the other hand, the outside layer will combat with wind, ice, and snow. Also, make sure your tent has a proper ventilation system so that it doesn’t bring cold from outside. One of the important features of a cold weather tent is material. Therefore, it must be made of thick fabric and long lasting. Also, it needs to be strong enough to deal with strong wind, snowfall or heavy rain. If the material is polypropylene and nylon, it will be able to keep you warm. So, choose a fabric that thick enough not only for warmth but also to stand steady during calamities. Before purchasing a tent, always check its accommodation space capacity. Because the number of people you are going to share with should be compatible with the interior space. However, if the tent is too big, then it will not keep you warm easily. So, use your intuition before choosing a tent that has a good combination of space and warmth at the same. Tent shape is another significant feature. For any type of tent, it is recommended to go for dome shape tent. It will help to easily slide down the dirt, filth, snow or rain. This shape also deals with heavy wind effectively. So, look for a dome shape tent. Wouldn’t it be great if your tent comes in a handy size and portable weight? Certainly. If you are searching for a lightweight tent for extremely cold weather, then you should go for the big budget backpack tents. Such a tent would also consume less space in your car. There are also cheap ones available that are a bit weighty. But, if you are among the ones who don’t want to compromise with comfort, then purchasing the lightweight tent would be a wise decision. There is a wide variety of tents available for the cold to extremely cold weather in different size and price range. You can get good quality tents within $120 to $1000 depending on the size and feature. However, we recommend you not to compromise with quality if you are in a limited budget. If you consider the above things before buying a tent you will get the best cold weather tents, which makes your journey comfortable. The tent may not have weather resistance capacity and waterproof tarp; thus you can suffer from cold being inside the tent. Here, we come towards the end of our 10 best extreme cold weather tents. The users highly recommend each of the tents for camping, hunting, hiking and so on. In our reviews, we have incorporated the strengths and shortcomings of the tents so that you can easily find your ideal one. To help you further, we have included some basic information regarding tents and tips to survive in cold weather winter activities. Hope you have a great camp experience with the best cold weather tents.